Web designers are in constant efforts to deal with the growing challenges of web designing in order to build user-friendly, innovative, consistent, and adaptable websites. Up till now, web design area has introduced countless ideas along with the capabilities of designing absolutely amazing and eye-catching web pages. With the emergence of such exceptional web design trends, Laravel Web development services are consequently flourishing by acquiring immense approbation. 2017 has proven to be a great year for web designers and web development companies since it has brought considerable advancements in web designing sector. 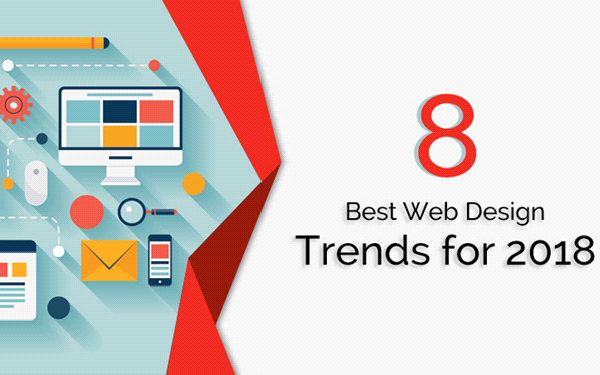 Definitely, the expectations from 2018 are high enough and there is a new opportunity for web design predictors to present us with their lists of new web design trends. Well, this is not new to you. Shadows have been a vital aspect of web design for a while, due to the advancement of web browsers, we are now experiencing some interesting variations. With the help of parallax layouts and grids, web designers are further experimenting with shadows to produce the illusion and depth of a world outside the screen. Shadowplay astonishingly builds adaptable effects that help to amplify User Experience (UX) and aesthetics of a web page. This trend is a direct response to the flat design trend which was once popular. Nowadays, Smartphone are proving to be the best means for everyone to shop and order they’re necessary stuff. This has significantly increased the challenges for designers to customize websites look for mobile devices. The roll-out burger comes in to picture, minimizing the menu for the small display. This helps to easily recognize UX issues and micro-interactions allow you to get instant feedback on your user’s actions. Not like the particle animations mentioned previous, smaller animations are useful enough to engage the visitor all through their whole experience on the web page. The animation is the best means for involving visitors in the story of a website by allowing them to visualize themselves in the characters. Apart from fun abstract visuals, animations prove to be finest for making meaningful interactions with the visitors. Many of the designers are experimenting with their custom approach of color with supersaturation and vibrant shades along with headers. Vibrant and even clashing colors can be helpful for novel brands so as to instantaneously fetch their users’ attention; however, it is also ideal for brands who would like to put themselves apart from the ‘web-safe’ and the customary. This trend is supposed to be going much popular in 2018. The best part of the asymmetrical layout is that it is distinctive, unique and sometimes experimental. Even if big brands with lots of content still makes use of conventional grid-based structures, the increase in the utilization of eccentric layouts across the web is expected, since brands build exclusive experiences to put themselves apart. Conventional brands usually may not be interested in this art, although large-scale brands that can afford risks will anticipate innovative ideas from the web designer. Flat design has been one of the ideal web design trends over dimensional colors; however, gradients are supposed to be a great comeback in 2018. Previously gradients were mostly seen as subtle shading to propose 3D. At present, gradients are loud, big and occupied with color. The most recent and prominent embodiment is a gradient filter over photos which is the best approach to make a less attractive picture look fascinating. Typography is continuously been an influential visual tool having the potential to build personality, evoke sensation and bring quality to a website along with conveying essential information. Since device resolutions are becoming easier to read, the increase in utilization of custom fonts is expected. Exclusive of Internet Explorer, a lot of browsers are able to support hand-made typefaces enabled by CSS. The web design trend of contrasting sans serif, large letters, and serif headings allows improving UX and making dynamic parallels. It is the foremost and essential thing to implement the new-fangled web design trends for your website, in order to sustain in enormous competition. Since the visitors are mostly attracted towards unique things and if your competitor is all equipped with a ground-breaking and feature packed website, it’s high time for you to adopt such new web design trends. Get in touch with us to design your astonishing website with most applicable design trends.